Summons a flaming familiar which will charge into battle and explode. Conjure Flaming Familiar is an apprentice level Conjuration spell that summons a Flaming Thrall which will rush towards your enemies and explode. 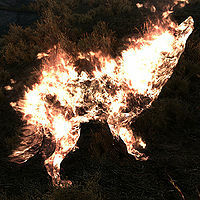 The Flaming Thrall appears as a fiery wolf, and uses melee attacks for the brief period before it explodes. Summoner, increase range to 200 ft at first rank or 300 ft at second rank. Conjuration Dual Casting, multiply spell cost by 2.8 (base 159.6, before reductions) in exchange for increasing the duration to 13.2 seconds, although it should kill itself well before this matters. Dual-casting this spell increases its duration but not its damage or area. Data in the Creation Kit indicates that this spell was originally intended to be a flaming draugr. In fact, unlike the actual familiar, the flaming familiar has neither the keyword to make it a familiar nor the keyword to make it a daedra. This also means it spawns with an Ancient Nord Sword or an Ancient Nord War Axe; it can equip this, as it has a right hand, and it may choose to do so, as it has 15 ranks in One-handed and uses the Draugr combat style, not the Familiar combat style. The explosion does damage to friends as well as foes, including the caster, so try to be out of range when it blows. If no foes are close enough, it will seek out and explode on the caster. The Flaming Familiar spawns with 1 Ancient Nord Sword or Ancient Nord War Axe, which it can equip. This page was last modified on 12 June 2018, at 14:11.